The reason serving sizes are important is because if there’s 16 grams of sugar per serving and 2 servings per container, you’d be eating 32 grams of sugar if you consume the whole thing. Always double check when using the label. Many people are obsessed with counting calories because they can determine if you gain weight or lose it. An average diet consists of 2,000 calories. By eating/drinking more than the recommended amount, you can gain weight. On the flipside, if you consume less than the recommended amount, you can lose weight. 40 or fewer calories is a low amount. 400 or more calories is high. “Let’s compare a 20-ounce soda with 240 calories to the equivalent number of calories from broccoli (which is about 7.5 cups). The soda has no fiber and no vitamins or minerals, but has 15 teaspoons of sugar in the form of high fructose corn syrup, caffeine, and phosphoric acid – which causes osteoporosis. The sugar in the soda spikes your insulin, causes a fatty liver, increases triglycerides, lowers good cholesterol, raises bad cholesterol, increases cortisol (the stress hormone), and causes diabetes, heart disease, cancer, and dementia. The broccoli (if you could actually eat the 7.5 cups!) has the same number of calories but about 1/2 teaspoon natural sugar and 35 grams fiber and is rich in vitamins and minerals, including folate and magnesium. Broccoli also contains powerful phytonutrients, which are healing plant compounds that help reduce your risk of cancer and boost your detoxification capacity. And broccoli has very little ability to raise your blood sugar. In fact, when it enters your body, the broccoli has the exact opposite effect of the soda. It creates health rather than destroys it. Same calories – very different results. Wow! I remember when I read this for the first time. I was completely shocked! By switching from low quality to great quality foods, we can change everything about our body. That’s amazing! Does It Contain Vitamins And Healthy Minerals? Unfortunately, many Americans are not receiving the number of vitamins and nutrients they need (and deserve). By becoming aware of the food label, you can proactively seek more of these wonderful, life-giving vitamins. Did you know? Calcium fights the occurrence of osteoporosis and fiber helps keep bowel functions healthy. Try to eliminate these substances out of your body. If you want to be healthy, you have to choose a side. Vitamins and minerals or life-sucking toxins? By eating too much of these, you will increase your risk for developing chronic diseases such as heart disease, cancer, and high blood pressure. I so wish people understood this part. The foods you’re eating either help you live longer or shorten your life span. There are many people who are sick and suffering because of the foods they’re eating. And you know why? Because they simply don’t know. If you read a nutrition label with too many of the above toxins, please reconsider your purchase. When I was younger, I used to look at the cereal box while I ate. (How many of y’all did the same thing?) Once I finished all the fun games on the box, I would take a look at the nutrition label. Since they have a huge list of vitamins, how could this not be healthy? But the truth is, we aren’t trained to look for the unhealthy things. We aren’t trained to read the labeling period. Unless we do a lot of researching, we would never know that most cereals are harmful to your health and are a horrible way to start the day. What Is The Daily Value Percentages? When I first saw this term, I felt a bit nervous. What on earth is a DVP? But they’re easy to understand and even if they weren’t, I would put them in a way you could understand. So all of the percentages are based on a 2,000 calorie diet. The percentage tells you how much of that substance is in that food compared to your recommended daily intake amount. If you’re recommended DVP is 100 grams of protein (which it’s not), then 20 grams would have a 20% next to it. Simple right? Easy peasy! I personally don’t use the DVP because I have a guideline in my home that tells me all my recommended intake levels. I do the math myself, but I understand that this is another way you can keep track of the nutrients are you receiving every day. Remember, too much of a bad ingredient can put you at risk for many illnesses and diseases. If you are using the percentages, remember that 5% is low compared to a high 20%. Strive for high amounts of vitamins and low amounts (none) of saturated fat, trans fat, sodium, and cholesterol. This absolutely breaks my heart! The food industry is preying on the uninformed and the poor to make a quick buck. After I learned the truth about dangerous foods, I promised to change my family tree. My children will be informed and have the necessary knowledge to choose what to put in their body. If you and I are going to make a difference in the world, it must start with us. Yellow 5 (Tartrazine) Banned in Norway and Austria due to cancer-causing effects. Yellow 6 (Sunset Yellow) Banned in Norway and Finland because it contains carcinogens. Blue 1 (Brilliant Blue) This product is banned in Norway, Finland, and France. Blue 2 (Indigo Carmine) Prohibited in Norway. Red 40 (Allura Red) This is banned in Europe because of hyperactivity produced in children. All the artificial dyes listed above create hyperactivity and reduced focus ability in children and contain cancer-causing agents. These can be found in many American foods such as candies, Mac & Cheese, cakes, cereals, NutriGrain bars, and so much more. Please read your ingredient labels and stay away from these toxins! If you’re reading a nutrition label and you come across this product, put it down and treat it like poison. I have a whole article about the dangers of high fructose corn syrup if you’re interested. Yikes! When I first saw this list, I was convinced MSG was in almost everything I was eating. Think about this: If an ingredient isn’t bad for us, why would companies go through such lengths to protect its identity? My family and I don’t shop at certain places because I know their foods are loaded with chemicals, like Dollar Tree or Save-a-lot. The goal is to eat real, whole foods. Many foods were cooked up in a science lab and only represent real foods. That’s right! They aren’t foods at all! Here’s a simple rule of thumb: If it takes longer to read the ingredients than it does to eat it, then don’t eat it. Look for a product with 5 ingredients or less that you recognize. Trans fat is in so many foods today, even peanut butter! The good news is most foods have one company that gives you a higher quality food alternative. Do your best to eliminate trans fat from your diet altogether. If you see hydrogenated oils or partially hydrogenated oils on the ingredient list, run far away! 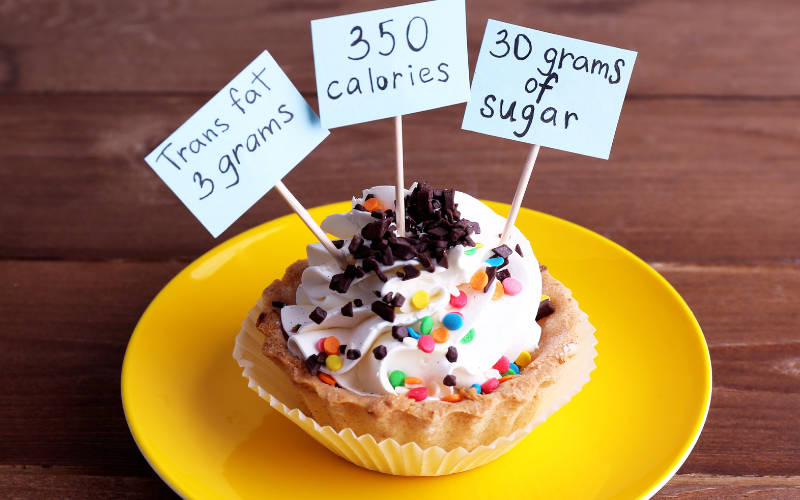 To find out more about trans fats, click here. Rapeseed oil AKA canola oil is extremely toxic to human health and should never be consumed by us. It’s used as a pesticide, triggered mad cow disease in animals, and contains the poisonous chemical hexane. I know for a fact that many people only buy this because it’s the cheapest oil to cook at high temperatures with. The food industry knows this. But if you’re going to turn your health around, you won’t need this in your kitchen. You can skip this section if you want to. If you’re going to be eating healthy, you’re going to read the nutrition label, not any ‘health claims’. But because it’s something that draws a lot of people in, it’s important to clarify their meaning. Let’s take a look at what these companies mean when they make these health claims. Reduced: Less than at least 25% of calories or the specified ingredient than the average product. Low cholesterol: Less than 20 milligrams and less than 2 grams of saturated fat per serving. Fat/Sugar Free: .5 grams or less of fat or sugar per serving. Calorie free: Each serving contains less than 5 calories. Low calorie: Each serving contains 40 calories or less. Low sodium: Less than 140 milligrams per serving. High in: Contains 20% or more of the recommended Daily Value of a specific nutrient per serving. Good source of: Contains 10-19% of the Daily Value of a specific nutrient per serving. I put these in here as a reference if you ever need them. Yup, a deeper look at health claims. Again, you can skip this section if you want because it’s not necessary to know when you read a nutrition label. However, many people buy foods based upon these claims when they have no idea what they really mean. The sad part is those who are buying these products want to be healthy, but they don’t know how. Therefore, they’re trusting these companies (the ones who are poisoning them) to aid them. Fat-free or sugar-free: If a product claims to have zero sugar, you can almost be sure there is some sort of artificial sweetener in the ingredients. The fake sugars can be more dangerous than the real stuff. Read the ingredient label to see if you notice anything such as acesulfame potassium, sucralose, and aspartame. The only beneficial sweeteners are raw honey and stevia. There are actually two forms of fat that are healthy: monounsaturated and polyunsaturated fats. By going completely fat-free, you’re missing out on a chance to eat something healthy. You just have to be informed. Organically grown, no artificial ingredients, or pesticide-free: The greatest quality of real organic foods have been USDA approved. Look for some indication that they have approved this product. Fruit drink: You should look for packages that say, “100% fruit juice”. Anything less has close to no real fruit and contains a bunch of added sugar. Enriched, fortified, added, plus, and extra: These words will always mean processed. Foods lose a lot of nutrients this way and make them no longer worth consuming. You want something 100% whole wheat. Made with multi-grains, wheat, or rye: Only a little bit of these products are whole wheat. Through the processing procedure, many benefits of the food were lost. Instead, always look for 100% whole wheat products. Don’t even buy ‘wheat bread’. It must be 100% whole wheat. Natural: This claim can be on anything that started as a natural ingredient. However, after processing the products there can be no resemblance to its former self. Look for “No Preservatives” and “100% All Natural”. When I learned how to read a nutrition label, my entire life was transformed. As you can imagine, I can’t just buy anything at the grocery store. My husband and I read every nutrition label before it goes into our cart. If the price is really low, there’s usually a reason for it. We don’t mind spending extra for our health. Plus, Americans spend millions per year on medicines to fight illnesses and disease that could’ve been prevented by healthy eating. As much as 80% of all American diseases are caused by the foods that we eat. Is The Sugar Level Dangerously High? I always look at the sugar amount first because high amounts of artificial sugar in one sitting makes me feel nauseous. I can eat a bunch of fruits, but one whole Gatorade bar makes me sick. Therefore, sugar levels are important to me and if it has more than 20 grams per serving, I will leave it on the shelf. Also, foods are listed in order from highest quantity found in the product. This means the higher up on the list, the more of that ingredient your eating. The next thing I look at when I read the nutrition label is the amount of sodium found in the product. Too much sodium in the body can lead to many health complications and when I eat too much, I feel like crap. The recommended daily intake of sodium is less than 1,500 mg per day (about the amount in a pack of noodles) so I try to keep my sodium intake as low as possible. There are foods I avoid altogether such as sliced ham (around 300 mg per slice), pickles (around 500mg per spear), and chips. Since I don’t have a diet rich in sodium, I’m very sensitive to salty foods. If it’s too salty, I simply won’t eat it. For example, the last time I ate Crunchy Cheetos the saltiness was horrible. Next, I look at the protein levels. Protein is absolutely necessary for a healthy diet. Not all foods contain high amounts of protein, like fruits and veggies. Therefore, I supplement my diet with the powdered form. However, I still like to look at the protein levels. My standard for protein is very high so I like to be aware of how much I’m eating. Most health officials recommend consuming .8 grams of protein per kilogram of weight (otherwise known as .36 grams per pound). Therefore, take your weight (in pounds) and multiply it by .36. That’s the amount of how many grams of protein you should eat a day. However, bodybuilders and athletes consume way more than that. A body builder’s rule of thumb is to consume the same amount of grams as pounds of body weight. I take both into consideration. I weigh 100 pounds, so I strive to consume around 50 grams of protein per day or more. Some days I begin my day by eating a breakfast containing 3 eggs and 3 slices of turkey bacon. That’s 24 grams of protein right there! If it passed those tests, the next thing I look for is trans fat. It can be on the top part of the label or found within the ingredients. I take a look at the total fat found within the product and see if the grams listed below add up to the grams of total fat. If not, I know there’s trans fat in there. Trans fats are one of the main reasons I don’t eat fast foods anymore. Almost all of it is cooked in shortening (pure hydrogenated oil). Yeah, I know. Every time I drive past McDonald’s, I think of poison. They’re feeding people poison. Because of the many health risks associated with trans fats, I aim to eliminate them from my household completely. I can’t bring myself to buy foods for my child that I know will damage to his body. Neither can I eat them and I hope you’ll make the same conclusion for yourself. If there’s low sugar, low sodium, no trans fat, and preferably some protein, then I move to the ingredient list. If I flip over an ingredient and instantly see a long list of ingredients, I take a quick skim and usually put it back. A lot of ingredients means highly processed and full of chemicals that aren’t meant for human consumption. When I find an item that has wholesome ingredients it feels like a win and I’m thrilled to eat it! Whew! We just went through a lot of information! If you made it to the end, congratulations! I can tell your dedicated! Once you learn to read a nutrition label, it’ll be like second nature. You’ll know exactly which foods offer wonderful benefits to your family and what to buy at the grocery store. Begin to shift away from eating foods out of a box, bag, or package because the greatest foods for your health are the ones that come directly from the earth. You cannot substitute 5 servings of fruits and veggies daily with anything else. Reminder: It’s a journey. We’ll always be learning and growing during this time on earth. For example, I didn’t try a raspberry until I was 23 and it was delicious! What wonderful foods are you missing out on by eating processed, factory, man-made junk? Always read the nutrition label before purchasing! Thanks for your interest in this post. I’m here if you have any questions or concerns. Please, don’t hesitate to reach out. Learned so much from this article!